In this centenary year of the start of WW1, there have been lots of tempting books on offer, which give voice to many stories which sum up the effects of war on a generation of young people.The story opens in 1913 as Eva Downey, a young Irish immigrant, learns that an unexpected legacy gives her the means of escape from a remote father and hostile stepmother. Attending finishing school in Eastbourne gives Eva the means to escape from her family circumstances and allows her a little freedom. Whilst at The Links, she meets and falls in love with her teacher, Christopher Shandlin, who is an admirable man with strong principles. However, as England is poised on the brink of war, strong beliefs do not meet the exacting standards of a nation who are sending hundreds of young men out to fight a war. Forced into to giving her sweetheart a white feather to denote his opposition to fighting, Eva must live with the consequences of her actions. The book is a beautifully written, with strong attention to detail and there is a real authenticity to the storyline which is maintained throughout the whole of the novel. The troubled early years of the war is recreated in intimate detail, made all the more shocking by the real ethical and moral dilemma faced, not just by Eva and Christopher but by the country as a whole. I empathised greatly with Eva and understood just how difficult life was during this awful time. The emotional journey of the story is really hard hitting at times, and the book seems to cover an awful lot of ground, not just about the war itself, but also about the women’s movement, suffragettes, conscientious objectors, burgeoning sexuality and marital infidelity, but it’s all remarkably well done and it soon becomes a real page turner of a story. 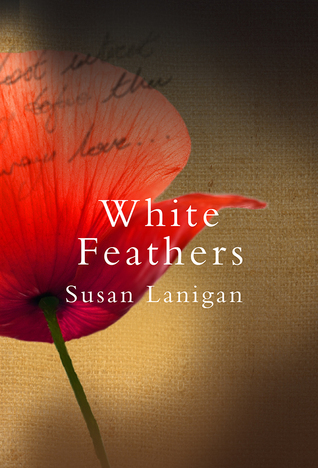 There is no doubt that this is a really good debut novel from a talented new author and I’m sure that White Feathers will stand out from the crowd of WW1 novels in this centenary year. My thanks to Real Readers and O’Brien for my review copy of this book.